First the simple bit: the very short term future of #EUtweetup is that the next tweetups will be on Monday 17th February in Brussels, and Wednesday 19th February in Berlin. The Berlin tweetup will be at Gorki Park from 1800 (details same as last time). 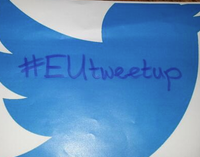 But what about #EUtweetup Brussels? Here I need your help. The event has grown into a large and remarkable network, and hence I think it’s time to reflect on what the future of the event actually should be, and where it ought to be held. The idea was to be an informal get together for people who had previously only debated EU politics together on Twitter. There is hence, in my view, no need for an agenda or any sort of speaker. The event needs to allow people to come and go as they please throughout the evening. Also as the event has no organiser or budget as such it needs to be easy enough to do – just a free reservation of a place, and then some tweets to announce it. However for me there are two main outstanding questions, and for this I need you assistance. Please answer the two polls below, and/or comment below! Currently #EUtweetup in Brussels happens on an ad hoc basis – it’s when Anthony Zacharzewski or I happen to be in Brussels, and we organise it. Should we keep it ad hoc, or should we set a date – second Wednesday or third Thursday of the month or something? Maximum one a month is plenty I think though. #EUtweetup has been at 3 main locations – James Joyce on rue Archimède, London Calling on Place de Londres, and Café des Epices on Place Jourdan. Neither the James Joyce nor London Calling serve food, while Café des Epices is too much of a restaurant. Some sort of compromise – where food is served as well as it being a pub – would be best. Old Oak and Kitty O’Shea’s at Schuman have been suggested to me as alternatives, although the pub quiz on Monday’s at Old Oak means the days a tweetup works there are narrower. I think one preferred location makes sense, with the opportunity to go elsewhere from time to time. Thanks Jon. Appreciate your efforts. I will take whatever option(s) have most support. Aloft hotel lobby may be worth considering as venue, though unsure if food is available there. It’s already used for monthly ‘green drinks’ and has plenty of chairs and sofas to spread out. Recommend pop-in when passing. I like the idea of ‘the week after Strasbourg’, but I’d be happy with ad-hoc too. For me, a tweet-up should happen when you’re in town. It’s less fun if you’re not here. As for the location, I’m fine with any decision. Great initiative and want it to succeed. One venue is possibly the La fleur en papier dore; the other is the micro marche cafe near st catherine. Sorry, Jon, I had missed this. I don’t know all the venues so haven’t picked one, but without enough space and quiet the event is almost useless to me. James Joyce is not big enough. I’m for a regular monthly date. Selfishly, I’d go for second Tuesday or second Thursday. How about Beermania, Jon? Suited our federlists meetings quite well and they serve snacks. I should have mentioned: we also need to try to avoid EP Strasbour plenary weeks. That rather speaks against a regular schedule… Unless it were to be “The Tuesday after a Strasbourg plenary” to give it a real EU nerdy Stammtisch feel?